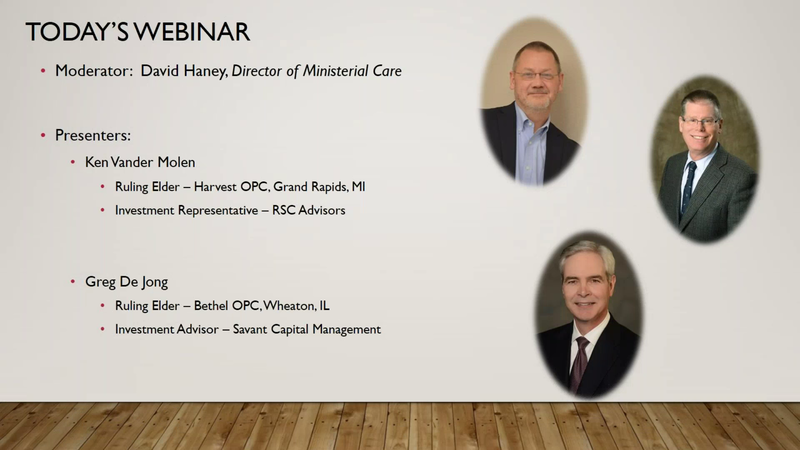 Maintains, manages, and provides oversight of the OPC Retirement Account. Provides or recommends counsel and assistance in financial risk management (Health, Life, Disability, Counseling, and such other types of insurance as may be advisable). Provides or recommends counsel and assistance in financial planning, including retirement planning and investment portfolio management. Maintains, manages, and provides oversight of the OPC Obadiah Fund; and provides for the diaconal needs of all OPC ministers and their widows. Informs presbyteries and local sessions of tools available for the care of their ministers. Consults with North American Presbyterian and Reformed Council churches and other churches of like faith and practice regarding their experience and best practices in the care of their ministers. Provides resources to congregations and presbyteries to improve the terms of calls. Maintains denominational salary scale guidelines. Maintains a voluntary and confidential database of OPC ministerial compensation. Provides advice to the General Assembly regarding the Book of Church Order on retirement related matters. Provides financial instruction and counsel in educational venues; e.g., the Ministerial Training Institute of the OPC. Assists presbyteries and sessions in considering other means of strengthening the care of ministers; e.g., ministerial mentoring, counseling, retreats, and sabbaticals. Tax-deductible donations to the Committee on Ministerial Care can be made payable to “Orthodox Presbyterian Church” and specified for CMC. Webinar #2: Will I Ever Be Able to Retire? Q: Are OPC Pension Plan withdrawals taxable? The OPC Pension Plan was replaced by the OPC 403(b) Plan, and withdrawals of money which was contributed on a pre-tax basis (which is generally the case) are considered to be taxable ordinary income, taxed at whatever your particular tax rate would be in the year of the withdrawal. 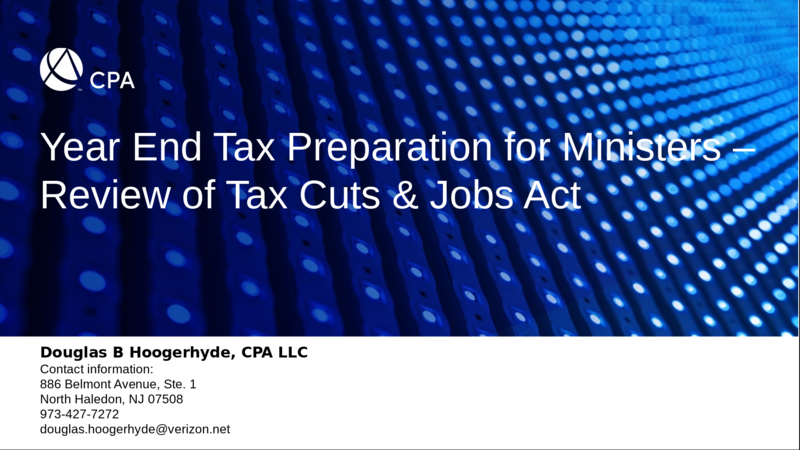 The exception, as we noted in the webinar, is that under current tax law, a retired minister could be withdrawing as much as $21,000 per year (for 2018) and have it considered Housing Allowance, thus making those withdrawn amounts tax free. Finally, if someone has made Roth (after-tax) contributions to the 403(b) plan, they can withdraw Roth balances tax free. Q: Is the $21,000 maximum from OPC Pensions for housing only? Yes, it can be used for housing-related expenses only. IRS Publication 517 covers the details of what qualifies. Although not mentioned in the webinar, the maximum amount that retired ministers can withdraw as Housing Allowance in 2019 will be $21,600. Q: What if you signed a Salary Reduction agreement all along? By “Salary Reduction Agreement all along”, I’m assuming that you mean an agreement you had signed with your church whereby they reduced your salary by X amount and submitted that to the OPC Pension Fund/403(b) Plan? If that’s correct, than yes, you were making pre-tax contributions to your account at least during the Pension Plan era; commencing with the 403(b) Plan era, those salary reduction contributions could have been either pre-tax or post-tax (i.e. Roth). Q: What is the Standard Deduction at 65? For your 2018 tax return, the Standard Deduction is $12,000 (single), $24,000 (married filing jointly), and an additional $1,300 per person if you are 65 or older. For tax year 2019, the amounts are $12,200 (single), $24,400 (MFJ), and still $1,300 per person if 65+. Q: If I have 40 quarters (of paying FICA/SECA taxes) and my wife does not, and I were to die, is she still eligible for Medicare? Generally, yes. A widow can claim Social Security and Medicare benefits based on her husband’s deceased earnings record as long as they were married for at least 9 months. This would be true whether your widow had any credits of her own or none. Remarriage could alter how she qualifies. Q: What was the source that money must come from to transfer to the OPC 403(b) Plan? In order to qualify to have withdrawals in retirement classified as Housing Allowance, the money would need to transfer from another 403(b) plan, and be attributable to wages that were earned as a minister. You will need to attest to this on the Wipfli 403(b) Rollover Form. The OPC 403(b) Plan can also accept transfers from IRA’s and certain other retirement plans, but those amounts would not be eligible to later be withdrawn as Housing Allowance. Contact Wipfli (www.opc.wipflihewins.com) for further details. Q: Can I transfer money from a Traditional IRA into my OPC 403(b) account? Yes; see answer to Question 6 above.